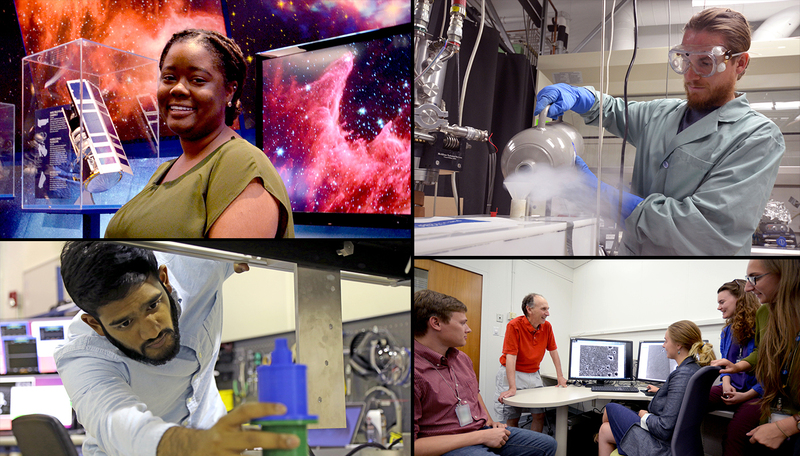 Since we can’t yet travel to planets outside our solar system, JPL intern Tre’Shunda James creates models of them right here on Earth. 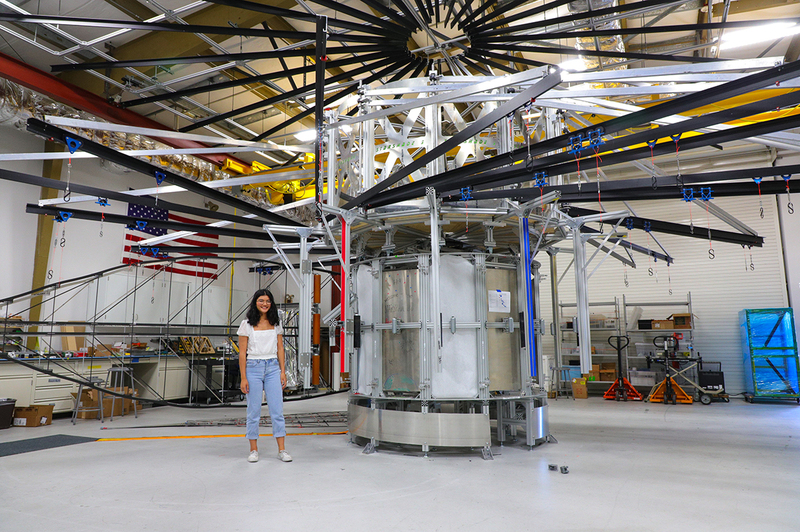 We caught up with the Occidental College physics and chemistry major to learn how she’s pointing the way toward potentially habitable worlds while helping lead the way toward diversity in her field. My project this summer is studying exoplanet atmospheres and the chemical components that are present in those atmospheres. I'm running a bunch of simulations, or models, using a computer code that my JPL mentor, Renyu Hu, published back when he was in grad school. I change a few things, run the models, look at the results, compile them and analyze what they can tell me about oxygen, which is a possible sign of life on these exoplanets [planets outside our solar system]. So in that way, it's really pushing the field forward in terms of finding out if life could exist on similar planets. What’s the ultimate goal of the project? The parameters we put into the model are to simulate a terrestrial, habitable exoplanet. Scientists have discovered exoplanets that are terrestrial, but we don't yet know if there's life on them. So this model is a theoretical basis that we can apply to many exoplanets that are discovered to see if they could support life. We just submitted the paper on our findings a couple weeks ago. Right before we submitted the paper, we were working nonstop on that. It was the hardest I’ve worked in such a short time. But it was very rewarding. It was the first time I’ve been an author on a science paper, so it was pretty cool. I learned a lot. Typically, I'd come in and look at my code. Sometimes it would run a couple hours and it would be done or it would run a couple days, so I was always anxious to see where it was when I get to my desk. If it was done running, I’d take the results, make graphs, make figures and analyze what I could. And if wasn’t done, I'd usually just start a new simulation. I feel that with the publication, I will contribute a lot, especially because we're scratching surfaces that have never been explored before. 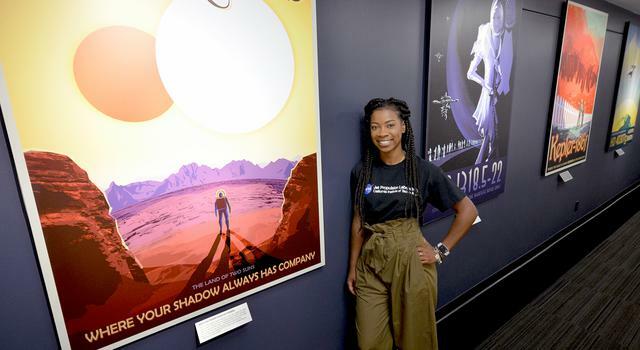 I also feel that I’m contributing as an African American, female engineer doing work in planetary science. I was looking up women in planetary science, specifically African American women, and the only one I could find passed away in 2015. So I feel as though just being here, exploring this field, is pushing the boundaries, and I'm excited about that. 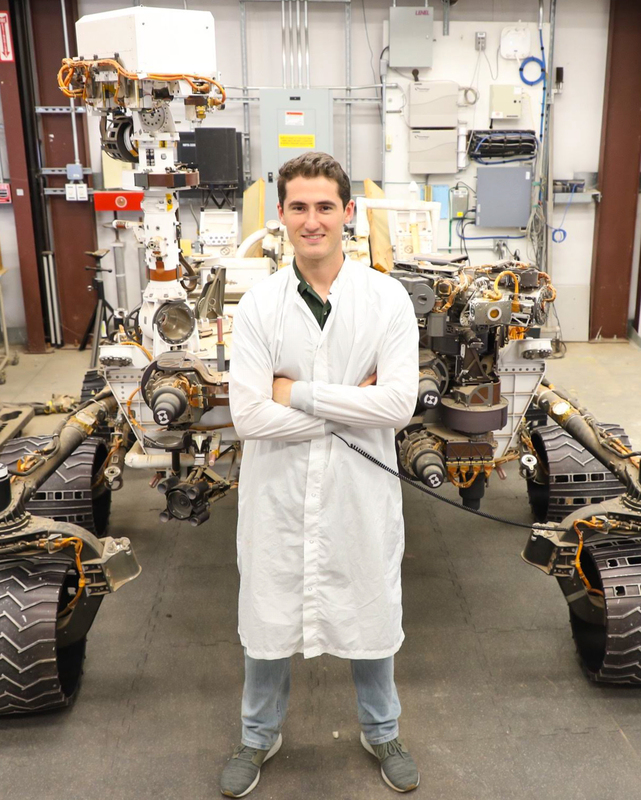 How did you find out about the JPL internship? 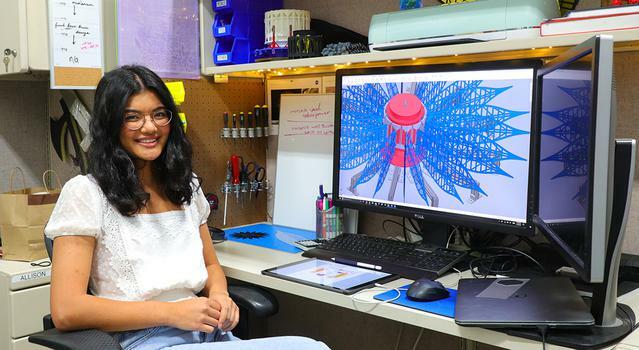 I'm a member of a group called COSMOS, Creating Opportunities in Science and Math for Occidental Students. They put me in contact with the SIRI program in the JPL Education Office last year. 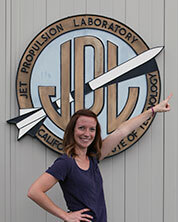 Before that, I didn’t even know that JPL existed. What's been your impression of JPL? It's kind of like school. It's like going to school with your professors. It’s pretty cool, the collaborative environment. OK, now for the fun question: If you could travel anywhere in space, where would you go and what would you do there? I would like to go to Saturn, mostly because I think it's beautiful, and it's one of the first planets that I ever learned about. What would I do there? I don't know exactly. It’s funny because I never really had a real interest in space until I started interning here. So everything is still kind of new to me, and I'm just learning about new missions and worlds every day. What about any of the exoplanets that you're studying? Would you want to go check out any of them? One thing we're looking to do is study the atmospheres of [the seven planets found orbiting the star TRAPPIST-1]. That would be really cool, especially because it's so close and it's one of the most recent planet-system discoveries. The Exoplanet Travel Bureau posters make it hard not to want to visit these places. Origami is going to space and Chris Esquer-Rosas is helping it get there. 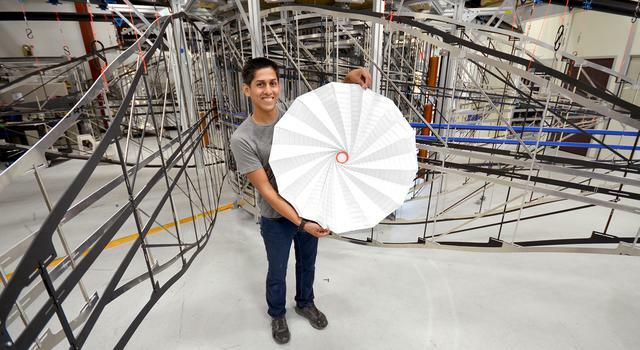 A computer engineering student at San Bernardino Valley College in Southern California, Esquer-Rosas used to do origami only as a hobby, but now he’s using it to build a giant sunflower-shaped structure that his team hopes will provide a new window into worlds beyond our solar system. Esquer-Rosas explains how he’s putting his origami skills to use and what got him folding in the first place. I’m working on Starshade, specifically the Petal Launch and Unfurler System. What is starshade and what is it supposed to do? Starshade is a proposal to fly a giant, sunflower-shaped shade in front of a space telescope, so we can directly image exoplanets, which are planets outside of our solar system. One of the big issues that we have is that we know exoplanets are there, but we can’t get the data we want about them because the stars that the planets are surrounding are too bright and they're basically blocking our view. So what Starshade is going to do is suppress or diffract sunlight while a telescope with all the science instruments directly images those exoplanets. It will probably be a little image, like one-by-one pixel, but with that one image, we can actually get a ton of data about these exoplanets – so carbon dioxide emissions, possibly water vapor, methane, gases and things like that. There's a lot of origami involved in building Starshade. How does it come into play? When it unfurls in space, Starshade is supposed to be 36 meters (about 118 feet) in diameter, which is about the size of a baseball diamond, and it's supposed to be only 2.5 meters (about 8 feet) in diameter when it’s stowed for launch. We’re using origami concepts to make that possible. Origami involves a lot of math. A lot of people don't realize that. But what actually goes into it is lots of geometric shapes and angles that you have to account for. One of the first things that I started doing on Starshade was helping with the stow pattern. So starting out with one sheet, how do you fold it so you can stow it at a much smaller size? Do you want it to be taller or shorter? How many folds do you want? And then, how small do you want it to be? We developed a bunch of algorithms, so now all you have to do is input the specs, push enter, and a new pattern is created instead of having to refold things over and over and over again. What are some of the challenges in getting that whole operation to work? There are lots of challenges. The first challenge is making sure none of the petals gets nicked. [Starshade is shaped like a sunflower.] The petal edges are razor sharp and they are what allow the light to be diffracted so we can image the exoplanet. The curvature of the petals has to be within half-a-human-hair-width accuracy, so we have to make sure nothing happens to them. If any of them gets nicked, then now we have this giant bright spot in our images. We also have to make sure all the petals end up in the correct position once Starshade unfurls. And we have to make sure no light comes through any part of the Starshade itself. Which of those challenges are you working on solving? What I’m working on is making sure none of the petals touches each other. That's one of the big challenges. We have to find a way to slowly unwrap the petals so nothing interferes or touches any of the petal edges or the petal itself. Tell me about your background in origami and how it brought you to JPL. I've been doing origami since the fourth grade, when my teacher read us “Sadako and the Thousand Paper Cranes.” At the end of the book, it teaches you how to fold your own paper crane. After I folded it, I just had this instinct to want to unfold it to see what it looked like. It has this unique pattern. So I started measuring it, and I figured out that different angles give you different lengths for the wings and the legs. So I was like, ok, what if you rotate the entire crease pattern 45 degrees? Now you get these more beautiful wings and you get a different shape. Then, I started folding other people's designs and learning how to design my own origami. I loved origami so much that I started learning the math behind it. A friend of mine, Robert Salazar, had started at JPL, and he was also an origami guy. We've been friends since seventh grade. He started on Starshade and then, eventually, he was leaving and he told them about me. They interviewed me a few times and then they were like, OK, come in and help us out. 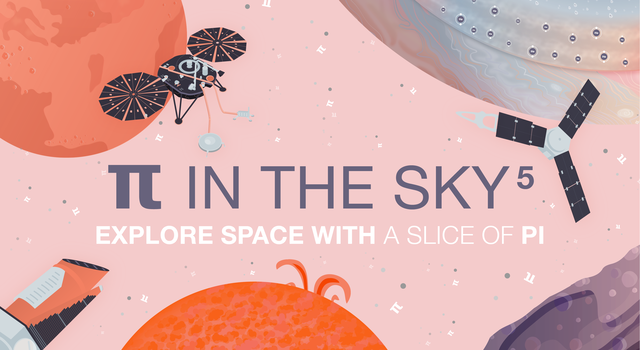 Before that, did you have any idea there was an application for origami in space exploration? I knew there were applications for other things like airbags and deployable mirrors, but I didn't know that there were space applications. That's what blew my mind. I was like, origami is going to space now? This is amazing. Are you studying something origami-related in school? I'm actually studying computer engineering, so it's completely different. Has interning with Starshade made you want to change your career path? It's like this close, because I've wanted to be a computer engineer since fourth grade as well. But since working here, a lot of the mechanical stuff has been a big learning experience. I didn't know mechanical engineering existed, but now that I do, it's amazing. I feel like I'm contributing because, right now, interns are on the front lines of testing out the hardware and making sure everything works. We're dealing with issues, trying to fix them, and coming up with ideas. I feel like we're actually contributing a lot to how this thing could eventually deploy in space. UPDATE - May 9, 2016: NASA's Solar Dynamics Observatory, or SDO, spacecraft captured stunning images of the May 9, 2016 transit of Mercury. Visit the mission's Transit of Mercury page to see a collection of videos of the transit compiled using SDO images. And have students play "Can You Spot Mercury?" in our educational slideshow. It only happens about 13 times per century and hasn’t happened in nearly a decade, but on Monday, May 9, Mercury will transit the sun. 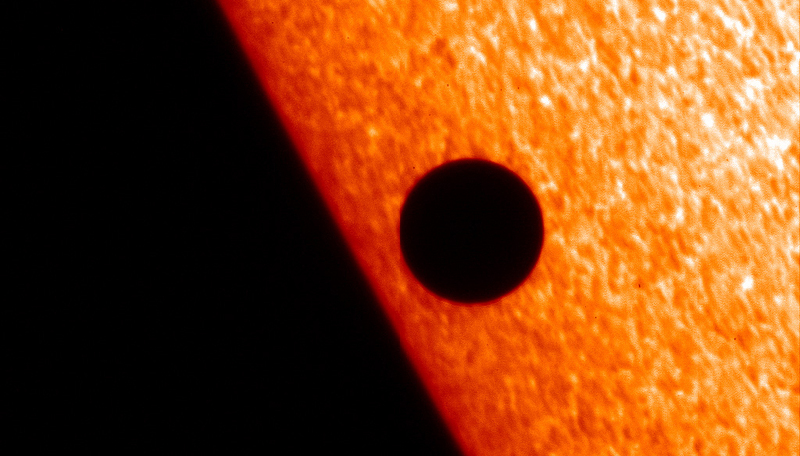 A transit happens when a planet crosses in front of a star. From our perspective on Earth, we only ever see two planets transit the sun: Mercury and Venus. (Transits of Venus are even more rare. The next one won't happen until 2117!) On May 9, as Mercury passes in front of the sun, viewers around Earth (using the proper safety equipment) will be able to see a tiny dark spot moving slowly across the disk of the sun. CAUTION: Looking directly at the sun can cause permanent vision damage – see below for tips on how to safely view the transit. In the early 1600s, Johannes Kepler discovered that both Mercury and Venus would transit the sun in 1631. It was fortunate timing: The telescope had been invented just 23 years earlier and the transits wouldn’t happen in the same year again until 13425. Kepler didn’t survive to see the transits, but French astronomer Pierre Gassendi became the first person to see the transit of Mercury (the transit of Venus wasn’t visible from Europe). It was soon understood that transits could be used as an opportunity to measure the apparent diameter – how large a planet appears from Earth – with great accuracy. In 1677, Edmond Halley observed the transit of Mercury and realized that the parallax shift of the planet – the variation in Mercury’s apparent position against the disk of the sun as seen by observers at distant points on Earth – could be used to accurately measure the distance between the sun and Earth, which wasn’t known at the time. Today, radar is used to measure the distance between Earth and the sun with greater precision than can be found using transit observations, but the transit of Mercury still provides scientists with opportunities for scientific investigation in two important areas: exospheres and exoplanets. Some objects, like the moon and Mercury, were originally thought to have no atmosphere. But scientists have discovered that these bodies are actually surrounded in an ultra-thin atmosphere of gases called an exosphere. Scientists want to better understand the composition and density of the gases that make up Mercury’s exosphere and transits make that possible. When Mercury transits the sun, it causes a slight dip in the sun’s brightness as it blocks a tiny portion of the sun's light. Scientists discovered they could use that phenomenon to search for planets orbiting distant stars, called exoplanets, that are otherwise obscured from view by the light of the star. When measuring the brightness of far-off stars, a slight recurring dip in the light curve (a graph of light intensity) could indicate an exoplanet orbiting and transiting its star. NASA’s Kepler mission has found more than 1,000 exoplanets by looking for this telltale drop in brightness. Additionally, scientists have begun exploring the exospheres of exoplanets. By observing the spectra of the light that passes through an exosphere – similar to how we study Mercury’s exosphere – scientists are beginning to understand the evolution of exoplanet atmospheres as well as the influence of stellar wind and magnetic fields. Mercury will appear as a tiny dot on the sun’s surface and will require a telescope or binoculars with a special solar filter to see. Looking at the sun directly or through a telescope without proper protection can lead to serious and permanent vision damage. Do not look directly at the sun without a solar filter. The transit of Mercury will begin at 4:12 a.m. PDT, meaning by the time the sun rises on the West Coast, Mercury will have been transiting the sun for nearly two hours. Fortunately, it will take seven and a half hours for Mercury to completely cross the sun’s face, so there will be plenty of time for West Coast viewers to witness this event. See the transit map to learn when and where the transit will be visible. Don’t have access to a telescope, binoculars or a solar filter? Visit the Night Sky Network website for the location of events near you where amateur astronomers will have viewing opportunities available. NASA also will stream a live program on NASA TV and the agency’s Facebook page from 7:30 to 8:30 a.m. PDT (10:30 to 11:30 a.m. EDT) -- an informal roundtable during which experts representing planetary, heliophysics and astrophysics will discuss the science behind the Mercury transit. Viewers can ask questions via Facebook and Twitter using #AskNASA. 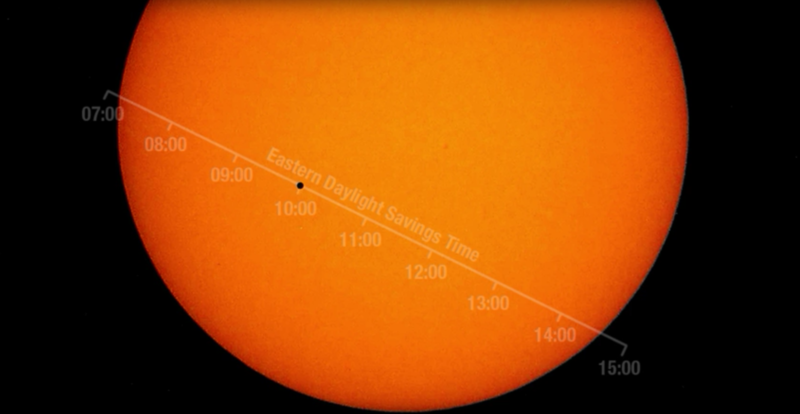 Here are two ways to turn the transit of Mercury into a lesson for students. Exploring Exoplanets with Kepler - Students use math concepts related to transits to discover real-world data about Mercury, Venus and planets outside our solar system. 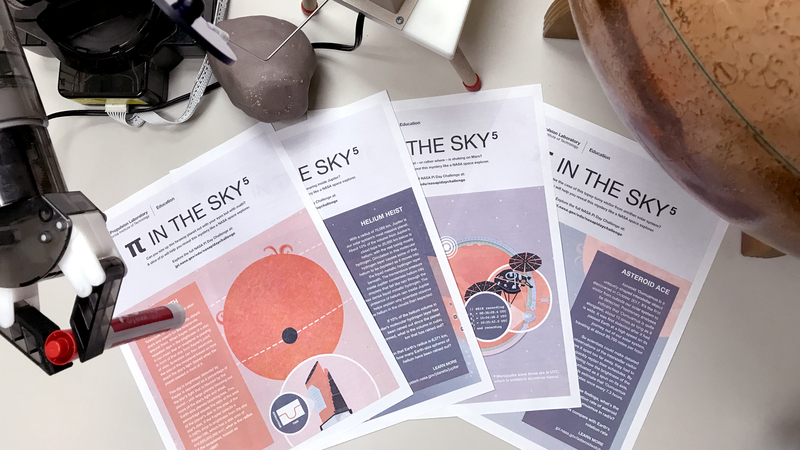 Pi in the Sky 3 - Try the "Sun Screen" problem on this illustrated math problem set that has students calculate the percentage drop in sunlight reaching Earth when Mercury transits. Video: What’s in an Exoplanet Name? Twenty years after the first discovery of a planet orbiting another sun-like star, scientists have discovered the most Earth-like exoplanet ever: Kepler-452b. Located in the habitable zone of a star very much like our sun, Kepler-452b is only about 60 percent wider than Earth. What makes it the most Earth-like exoplanet ever discovered? First a couple definitions: An exoplanet is simply a planet that orbits another star. And the habitable zone? That’s the area around a star in which water has the potential to be liquid -- not so close to the star that all water would evaporate, and not so far that all water would freeze. Think about Goldilocks eating porridge. 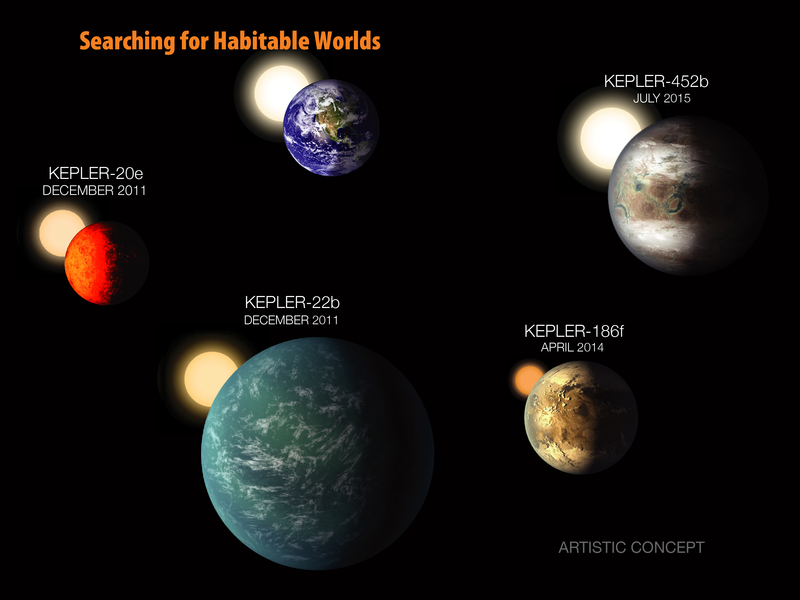 The habitable zone is not too hot, and not too cold. It’s just right. Okay, back to Kepler-452b. Out of more than a thousand exoplanets that NASA’s Kepler spacecraft has detected, only 12 have been found in the habitable zone of their stars and are smaller than twice the size of Earth, making Earth-like planets a rarity. Until this discovery, all of them have orbited stars that are smaller and cooler than our sun. 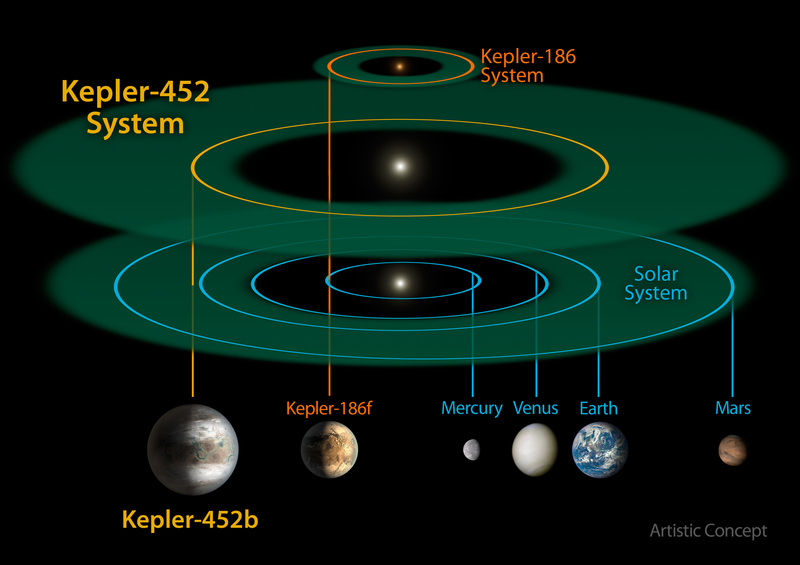 Kepler-452b is the first to be discovered orbiting a star that is about the same size and temperature as our sun. Not only that, but it orbits at nearly the same distance from its star as Earth does from our sun! Conditions on Kepler-452b could be similar to conditions here on Earth and the light you would feel there would be much like the sunlight you feel here on Earth. Scientists believe that Kepler-452b has been in the habitable zone for around six billion years -- longer than Earth has even existed! The Kepler spacecraft, named for mathematician and astronomer Johannes Kepler, has been working since 2009 to find distant worlds like Kepler-452b. It does so by looking at more than 100,000 stars near the constellation Cygnus. If one of those stars dims temporarily, it could be that an object passed between the spacecraft and the star. If it dims with a repeatable pattern, there’s a good chance an exoplanet is passing by again and again as it orbits the star. The repeated dimming around one of those stars is what led to the discovery of Kepler-452b. This exciting discovery provides opportunities for students to practice math skills in upper elementary and middle school, and gives high school students a practical application of Kepler’s third law of planetary motion. Take a look below to see where these might fit into your curriculum. After learning about Earth’s cousin, students might wonder about a trip to this world. 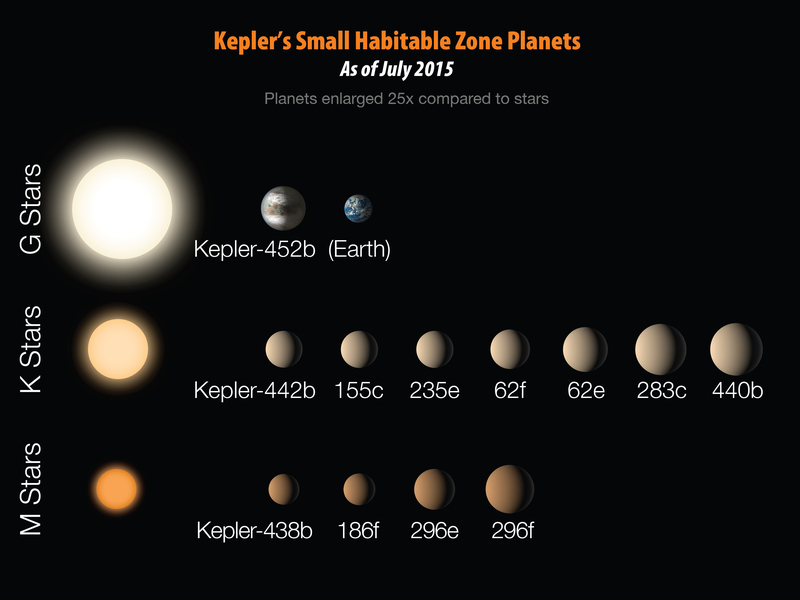 Scientists have calculated the distance between Earth and Kepler-452b at 1,400 light years. A light year is a measure of distance that shows how far light travels in one year. It’s equal to about 10 trillion kilometers (six trillion miles) or, to be more precise, 9,461,000,000,000 kilometers (5,878,000,000,000 miles). 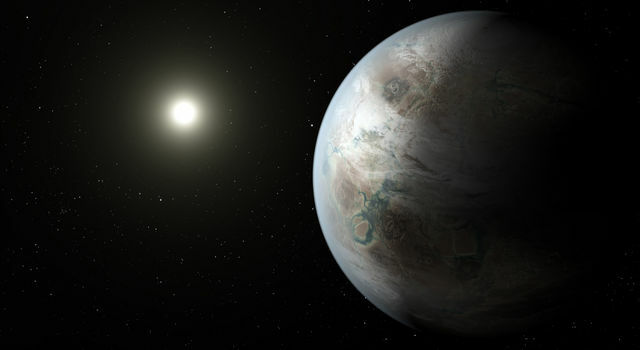 Ask students to calculate the distance between Earth and Kepler-452b at various levels of precision, depending on what they are prepared for or learning. For an added challenge, have them determine how long it would take a fast moving spacecraft like Voyager 1 traveling at 61,000 kph (38,000 mph) to reach this new world. Note: Due to the approximations of spacecraft speed and light year distance used for these problems in both standard and metric units, there is a variation among the answers. The time between detected periods of dimming, the duration of the dimming, and the amount of dimming, combined with a little math, can be used to calculate a great deal of information about an exoplanet, such as the length of its orbital period (year), the distance from its star, and its size. Kepler-452b has an orbital period of 384.84 days -- very similar to Earth’s 365.25 days. Students can use the orbital period to find the distance from its star in astronomical units. An astronomical unit is the average distance between Earth and our Sun, about 150 million kilometers (93 million miles). Kepler’s 3rd law states that the square of the orbital period is proportional to the cube of the semi-major axis of an ellipse about the sun. For planets orbiting other stars, we can use R = ∛(T2 ∙ Ms) where R = semi-major axis, T = orbital period in Earth years, and Ms = the mass of the star relative to our sun (the star that Kepler-452b orbits has been measured to be 1.037 times the mass of our sun).